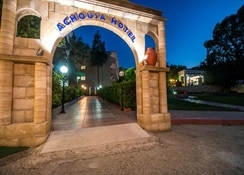 The Achousa Hotel is set amid beautiful gardens and away from the bustling centre of Faliraki, enabling guests to relax and unwind while still being able to explore the exciting side of the island. The 3-star complex offers guests pleasant rooms, an on-site restaurant and bars as well as a beautiful outdoor pool surrounded by gardens where guests can kick-back in style. 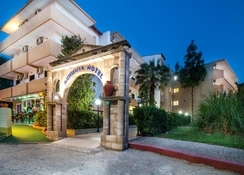 However, guests can make the short journey into Faliraki centre if they want to explore the lively atmosphere and wonderful beaches. 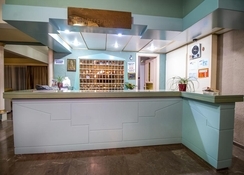 The Achousa Hotel delivers a perfect balance of peace and tranquillity while still offering guests the chance to immerse themselves in the fun and excitement that Faliraki has to offer. Guests will feel as though they are a million miles from anywhere as they relax around the pool but the centre of Faliraki is just 1km away. Here they can find a huge choice of bars and restaurants as well as beaches and clubs. There’s something for everyone here as guests can choose to relax on the beach, try the watersports or head to the water park where they will find an impressive choice of slides. There is a golf course just a short drive away, making this the ideal destination for those who want a bit of everything during their holiday. The airport is 16km from the airport. The complex offers a total of 84 guest rooms and all of which come with an attractive design and feel as well as plenty of space for guests to relax in. Here guests can choose from Double or Twin Rooms, all of which come with private balconies, en-suite bathrooms with a hairdryer, fridge, Wi-Fi, TV, telephone, safe and air conditioning all of which ensures that guests have a comfortable stay. Throughout the day, guests can enjoy a wide range of choice including local and international dishes served at the on-site restaurant. In between meals, guests can enjoy a light snack from the snack bar by the pool or they can choose to relax with a drink in hand from the bar. If that is not enough, there is plenty of choice when it comes to bars and restaurants at the resort centre just 1km away. 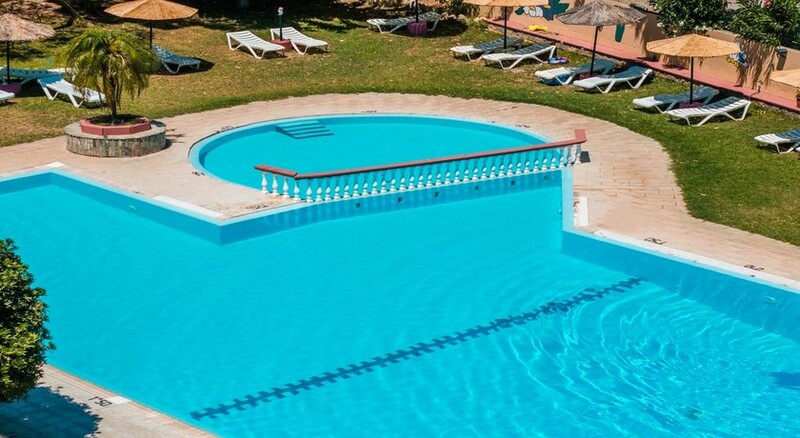 The outdoor pool invites guests to enjoy the cool waters or sunbathe on the sun terrace that surrounds it while there is a separate pool for the little ones to enjoy. Guests can head to one of the many beaches located nearby where they can enjoy watersports or they can spend the day riding the slides at the local water park. Keen golfers can escape for a few hours as the local golf course just a short drive away. We booked this though Teletext as one of the holiday options they provided us with. It's a lovely friendly family-run hotel with a bar and pool table (which our teenage children loved). Large pool with a café alongside, where we had dinner a few times. We were going to hire a car, but there's a bus stop right outside the hotel with a good service along the coast to great beaches, tourist attractions and Rhodes town. Thoroughly recommended, a great holiday. We booked this hotel after a wonderful stay there last year. Sadly we were very disappointed with the food this time. Last year, whilst you only have a choice of 2 each night, the meals were good old fashion food cooked by the old Mama - fabulous. We discovered upon arrival that each season every staff member switches - so if you worked in the kitchen/bar last year you were on reception this year etc etc. Very poor quality and service. This hotel does represent good value for money. The pool is amazing, one of the best. Rooms are basic but that did not bother us as we did not go to Greece to stay in our room other than to sleep and shower. The rooms are being updated and the one we had a sneaky look at really was of a high standard. Staff are wonderful. The best option would be to book self catering and eat out.